Ladybug’s mechanical problems, the inevitable ones I was too inexperienced to detect, started showing up almost immediately. Considering that I learned to drive by watching instructional videos on the interwebnets and by relying on the kindness of strangers, you’d expect that her ultimate fate was determined by my abuse of the clutch, but this was not the case. Pretty much everything but the transmission went wrong with my poor Ladybug. I brought her home at the end of August, and I was driving fairly competently by the end of September. By October, I was no longer stalling on hills (but still cursing at every fool who placed a stop sign at the top of a hill). By Christmas, I no longer needed my gas-clutch-gas mantra. In January I could do a k-turn in one fluid motion instead of three distinct steps, and I could parallel park, often on a hill, without incident. Sometime in February, I got cut off by a ginormous SUV making a left turn from the center lane, and not only did I not hit the jerk, I stopped short without stalling. That’s when I knew I had really mastered driving stick. The details of my driver’s education are worth recording, worth recounting, and I will, but for the moment: Ladybug. My first afternoon with Ladybug, I hurched and lurched all over Connecticut. I started out at Montesi Volkswagen in North Haven. My thought was that while a dealership would be more expensive, they would be the best ones to check her over first, because they would know the usual problems with the car, and would give me the best advice, starting out. I was right about the more expensive part. Montesi’s shop is closed on the weekends, so I only dealt with salesmen. They welcomed me to the Volkswagen family, and they were polite when they saw the condition of Ladybug. One salesman gave me a driving lesson around the parking lot, much like McGruff did. Some of what he advised me contradicted what McGruff had said — I’d been reading and watching enough that I was learning to detect what was a style choice and what was basic knowledge. I asked the salesman what to expect with Ladybug — I’d done some research already and knew there were some minor recalls, and some potential problems, but I figured he could tell me more. “It’s a great car. You won’t have any problems with it,” he assured me. One of those statements was true. The very next day, Sunday, I planned to take her down to Long Island to show her off to my parents and the Little Brother, who was visiting from DC. But instead, I had to take her to get four new tires because the tread on the rear driver’s-side was completely separated. It looked like a ratty old sneaker whose sole has come unglued. Jittery had owned the car for just over a year, and he only put 5000 miles on it. And the family before him had it for almost seven years, and they only put 53,000 miles on it. I don’t know a whole lot about cars — well, I know more now than I did last August — but what I do know is that cars need to drive, not sit. Ladybug sat. And sat. And sat. So day one: four new tires. I drove her for about a week before Montesi could do the checkup for me, and some strange things were happening. Sometimes she wouldn’t start. And sometimes all of her dashboard and console lights randomly blinked on and off. And occasionally, the engine would just shut off while I was on the highway, when I shifted from fourth to fifth, but I figured all of this was due to user error, because, after all, I still didn’t know what I was doing. Montesi charged me an outrageous amount of money to tell me that she was basically fine — she needed an oil change and the front brakes were 80% worn, but everything else checked out. About a month later, both of my headlamps burned out. Someone at AutoZone may have handled the halogen bulb improperly, because the replacement bulb went first, and shorted out the system and popped the other one. (This is a known problem with Beetles — the halogens burn quickly and have a tendency to cause other electric problems when they go. Which, at 20 bucks a bulb, ew.) I was in Virginia at the time, so I had to take her to another VW dealership. It took them almost two hours and it cost me over $200. For two light bulbs. Apparently, at some point in her life, probably before Jittery, Ladybug had been in an accident and had not been put back together properly: nothing in the front end of the car lined up as it should. Some time after the headlamps went, the trunk filled with water. The drains from the sunroof were clogged, and so water was draining directly into the trunk. I paid Montesi more than I’m willing to admit to fix it, but I will be reimbursed for this because it’s part of a class-action lawsuit against VW/Audi. I had Ladybug completely cleaned, but I battled mold spots in the trunk padding for months. This was just the beginning. At the end of October, the battery died. Montesi replaced it, but the new battery died on the Friday after Thanksgiving. I was stranded in the Home Depot parking lot just off 95 in East Haven. Montesi said they couldn’t help me because it was the holiday weekend — well, they could help by towing the car to the dealership and fixing it Monday or Tuesday. Um, what? The month-old battery you put in failed and you want me to wait three days without a car for you to replace it? Really? I guess you don’t want anymore of my money. But this minor disaster turned out to be the best thing that could have happened to Ladybug. I have roadside assistance through my insurance, and they towed me to RJ Shore on Shore Drive in Branford. If you live in Connecticut and you are reading this, you need to know that these guys are the best mechanics in your state. They took such incredible care of me and my Ladybug for the months I drove her — I cannot say enough good things about them. They are honest, they are reliable, and they are friendly, all of which are just as important as being the absolute best mechanics you’ll find anywhere. One of the owners of RJ Shore was there the night Ladybug and I showed up, and he stayed late to replace the battery. He gave me the documentation I needed to get a refund from Monesti. I did get that refund, but only a partial one — they only refunded the cost of the battery itself, not the extra charges for labor and a “systems check.” For every good word I can and will say about RJ Shore, I will say three or four bad ones about Montesi. So let’s see. At RJ Shore, my favorite mechanic of all time, Harry, replaced the front brakes. And then the timing belt and water pump. He saved the water pump to show me: the little propeller thingy on top had only one blade left. This may have had something to do with that random stopping on the highway between fourth and fifth gear. But then the front grille disappeared. The front grille had always been a bit of a hassle. It had a tendency to pop off in one corner, which meant I was constantly sticking it back in after misjudging curbs or hitting too many potholes. The grille had openings where fog lights belonged, but no fog lights. But one day, the grille was just gone. I still drove, but only locally, because without the grille, the radiator was completely exposed, and one kicked-up rock on 95 could be the end of me and Ladybug. I ordered a new grille and fog light kit on eBay and brought it to Harry. Harry had to print out the specs from the Volkswagen website because he’d never installed fog lights on a Beetle before. One of the things I love about Harry is how he does research — there’s no one more knowledgeable, but if he’s ever uncertain, he goes and looks it up before taking things apart. And he explains everything to you before he goes taking things apart, in his very endearing, stammering, stuttering way. I wish I could take him to California with me. She was up on the lift, at about my eye level. Harry said: “So, the mystery is not how your front grille disappeared. The mystery is how your radiator has not dropped onto the street by now.” He pushed on the radiator, and we both watched it swing back and forth: eee-oo-eee-oo. He pointed to a crack in the bottom of the fiberglass frame that should be holding the radiator in place. He pointed to all of the holes in the connection where bolts should be. The radiator was held in place by two bolts and the pipes and hoses and whatnot that connect it back to the engine. Harry pushed it again, just for effect. Eee-oo-eee-oo. Harry MacGyvered Ladybug back together. A few uneventful months went by, during which I tacked on another 10,000 miles or so. But then I started hearing a funny noise. A metal on metal noise. A metal rod rattling in a tin can noise. 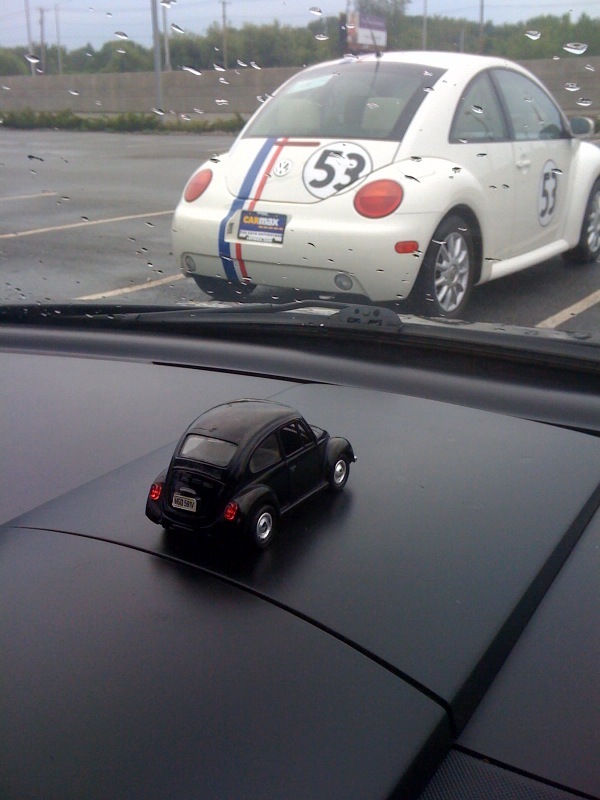 I brought it right to Harry, who told me Ladybug was two-and-a-half quarts low on oil. In a four-quart oil tank. He showed me how to check the oil, and instructed me to check it every time I got gas and to keep bottles of oil in the trunk to refill it. We monitored it, we tried heavier grades of oil and special additives, but nothing really helped: I was adding a quart of oil with every gas fill-up, which was about a quart every 500 miles. Which is not good. This is a known problem with Beetles around this age — the seal on the piston rings becomes less, well, sealed, over time. Harry and the other guys at RJ Shore started to hint that it was time to get rid of her or to spend three or four grand to overhaul the engine. Driving her across the country was out of the question. I bought Ladybug in August 2009 with 58,694 miles on her. I drove her everywhere: into the city or out to Long Island once a week, to Maryland, DC, and Virginia countless times, to Boston on occasional bouts of insomnia drives, to South Carolina (another story that will have to wait). I learned to drive stick in Ladybug; I rediscovered independence and a very particular type of confidence in Ladybug. In May of 2010, she had 79,887 miles, the best and hardest of which I had put on. I couldn’t give up on Ladybug. And having just been traded in myself for a sporty younger model, you can imagine how I felt about giving up on my Ladybug. But yeah, I guess you could say I totally gave up on Ladybug. So what kind of car could possibly take the place of Ladybug? Only the Lovebug, of course.